BRODIE-BROCKWELL’S INVENTIONS HELPED REWRITE DENTISTRY BOOKS. If you’ve got a headache, there may be something wrong with your teeth, said an 87-year-old retired dentist who has spent more than 50 years researching the connection between dental problems and pain. Dr. Charles Brodie-Brockwell, of Lindsay, was awarded a 50-year service pin from the Ontario Dental Association, and was honoured by about 45 colleagues from the Peterborough and District Dental Association at a dinner at the Otonabee Inn last night. “I’ve done a lot of work. I’ve made a lot of discoveries over the years,” said Brodie-Brockwell, who retired from treating patients just last year, at age 86. He is continuing to conduct research, he said. Dr. C.G. 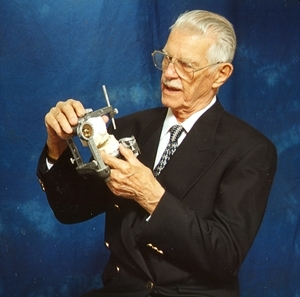 Brodie-Brockwell examining models mounted on a fully functional articulator , an essential instrument used in the accurate diagnosis of Migraine. His research into the dental causes of headaches, balance problems, nausea and shoulder pain has led to the rewriting of dentistry books, he said. “I think I annoy a lot of people in dentistry because of my discoveries. They have to change the books because of me, and some of them don’t like that too much,” he laughed. As an example, Brodie-Brockwell explained how a new filling can cause headaches. “If something interferes with the free movement of your teeth, the muscles that move the lower jaw are set into spasm. The circulation stops, lactic acid builds up, and pain results,” he explained. Brodie-Brockwell began his research when he set up his practice near Montreal, shortly after he graduated from McGill University. In 1971, he and his wife moved to Lindsay, where he exclusively treated only those patients who experienced dental-related ailments. Over the years, he’s treated more than 4,000 patients; some from as far away as California. Brodie-Brockwell eventually published a book of his findings, called The Myofascial Syndrome: Its Causes and Treatment. Brodie-Brockwell has seen “tremendous” changes in dentistry over the years, he said, such as the introduction of the high-speed drill and improvements in injectable anesthetics.